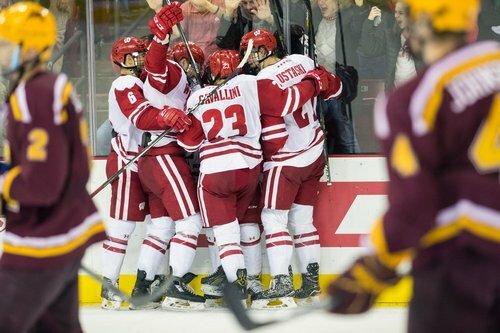 The University of Wisconsin men's hockey team goes on the road to face Ohio State in Big Ten play. Frederic gets sent to the sin bin and UW will be back on the PK. 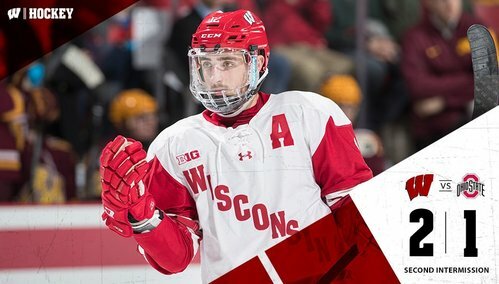 2-1 Badgers with 14:36 to go in the second. #Badgers kill a boarding minor to Frederic but the Buckeyes have outshot them 7-1 in the second. Kill! Badgers allow the Frederic minor to expire for their second penalty kill of the evening. Fisticuffs exchanged between Greenway and Fidler and Greenway gets a double minor while Fidler gets one. Third PK for the Badgers. Teams are back to even strength. Greenway stays in the box for two more minutes with 8:20 to go in the second. UW 2, OSU 1, 6:13 left/2nd. Media timeout. Shots are 8-3 OSU in the period. 6:13 left in the second period with the Badgers up 2-1. OSU leads in shots 15-14. Badgers still holding on to their lead with under three minutes in the second. UW did a nice job of weathering offensive pressure from OSU. UW's Berry has stopped two OSU breakaways in the second period, the most recent a pad stop on Fidler. UW leads 2-1 with 1:29 left in 2nd. End 2: Wisconsin leads Ohio State 2-1. 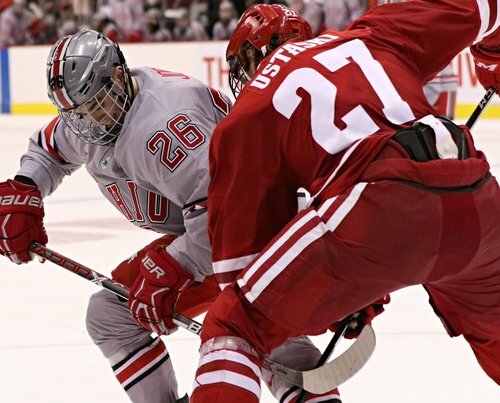 Buckeyes pulled within 1 on Weis' second-period goal. But, Wisconsin still up, 2-1. ✌️ periods down. ☝️ to go. Badgers up 2-1 heading into the third at Ohio State. Long spells of action without a whistle as we near the halfway point. Badgers still up 2-1. OSU leads SOG 24-20. UW 2, OSU 1, 9:32 left/2nd. Media timeout. Just 7 shots on goal in the period - OSU 4, UW 3. #Badgers lead Ohio State 2-1 with 5:35 left in the third. UW 2, OSU 1, 5:35 left/3rd. Last media timeout. UW up 6-5 on shots in the period. Berry continues to stand tall in between the pipes for UW with 5:35 to go in regulation. He has made 24 saves on 25 shots so far tonight. UW 2, OSU 1, 4:53 left/3rd. Now it's the last media timeout. 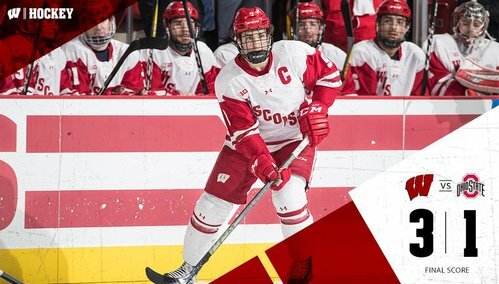 1:50 to go in regulation and the Badgers continue to hold on to their slim 2-1 lead. OSU pulls Frey for an extra attacker with 1:46 left. #Badgers lead 2-1. UW 2, OSU 1, 1:36 left/3rd. Buckeyes skating with net empty. Ryan Wagner puts one in the empty net for a 3-1 #Badgers lead in the final minute. FINAL: Wisconsin beats No. 8 Ohio State 3-1 for its 2nd straight win over a top-10 team. 12th win of season equals last 2 years combined. Jack Berry stopped 26 of 27 shots for the #Badgers , who are 3-3 against top-10 teams this season. Win over Ohio State pushed @BadgerMHockey to 20th in the PairWise, in case you check on those kind of things. FINAL: Wisconsin 3, Ohio State 1. UW with an empty netter to seal win. Down goes #8 Ohio State! Big road win for the boys! Matthew Freytag, moved onto 3rd line because of injury to Jason Ford, ended up with a team-high 4 shots on goal and the game-winning goal. Tony Granato points out that @BadgerMHockey won special teams battle without getting a power play. UW scored short-handed, held OSU to 0/3. In their 3-1 victory over Ohio State, the #Badgers failed to reach 30 shots on goal for the first time in 17 games. Outshot 27-25. 25 shots on goal also is a season-low for the #Badgers , dropped them to 3rd nationally in SOG per game (35.29). Next stop, New York City. Goals from Kunin, Freytag and Wagner directed the Badgers to their second-straight win over a top-ten opponent.